My husband and I are only in Austin for a couple days, and we wanted to try some local, delicious food. 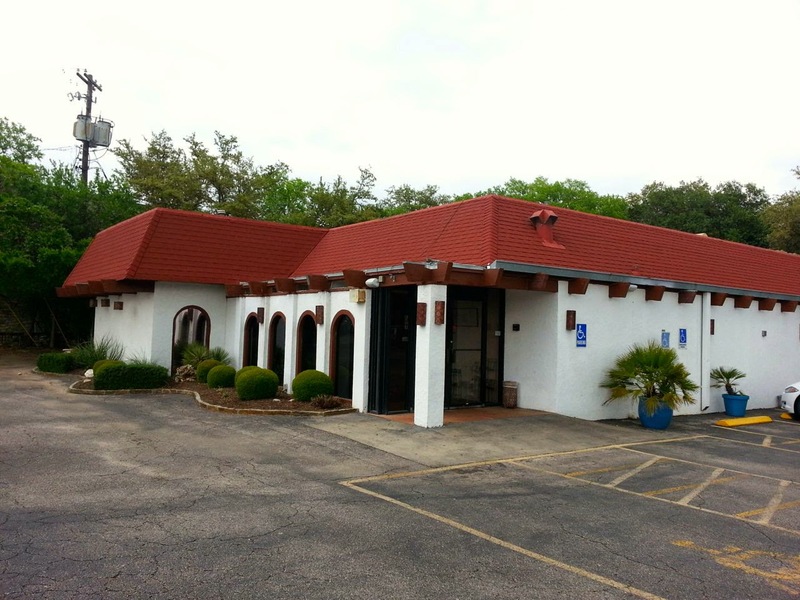 A friend recommended Tres Amigos for great Tex-Mex. I looked at the menu online and was really impressed, so we decided to go there for a late lunch/early dinner today. 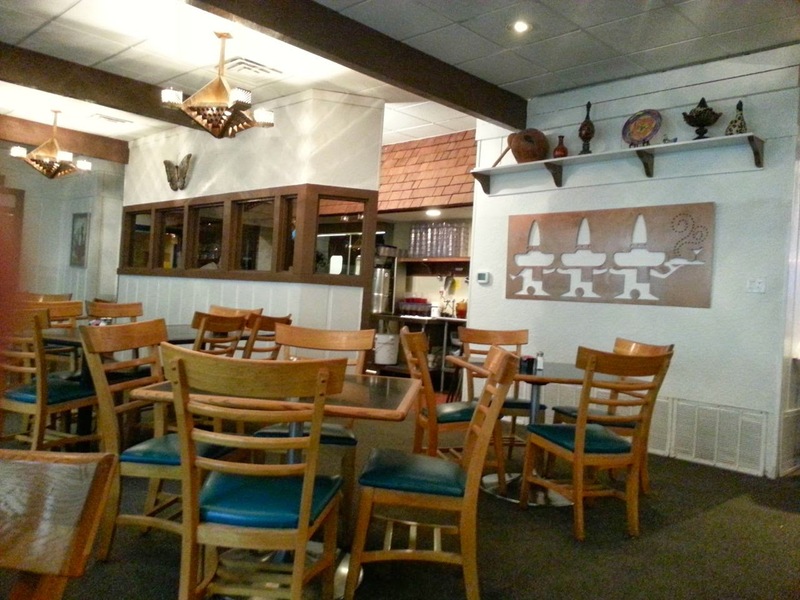 We arrived at the Tres Amigos Westlake location around 4pm. The restaurant was almost empty at that time, and we were seated right away. We had a great table by the windows. There was a fountain outside, and we watched the wildlife. While we were there, we saw a dove, a fox and a black bird. It was pretty cool. The waiter brought chips and salsa out right away. The chips were amazing. They’re probably the best chips I’ve ever had. They were so flaky and crisp. I don’t know if they’re made in-house or not, but they taste like they are. The salsa was heavy on the tomato flavor. At first I thought, “I like the salsa at Chevy’s better,” but the more I ate it, the more I liked it. It has a great spicy kick to it. We ordered the Shrimp Diablo for an appetizer. 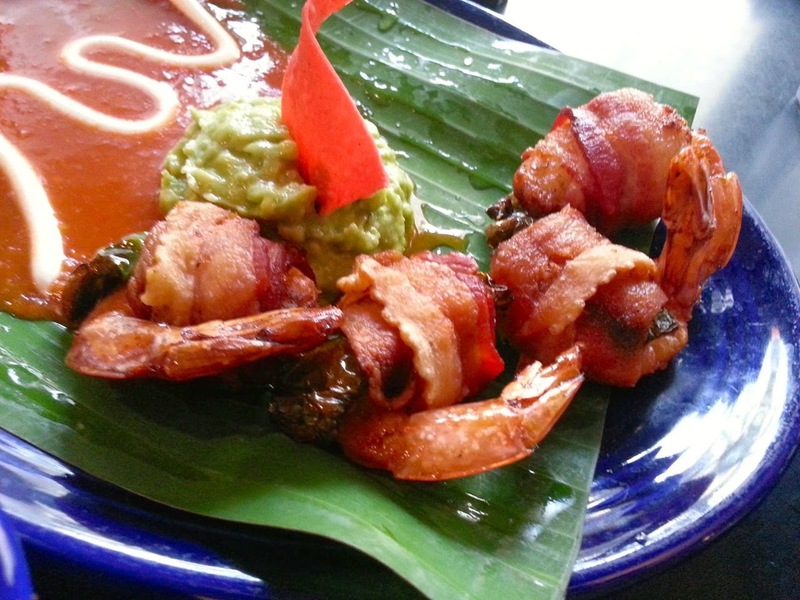 It’s described on the menu as “bacon-wrapped jumbo shrimp stuffed with jalapenos and jack cheese.” You can order 4 or 8. We decided just to get 4. It came with some sort of red sauce, which I wasn’t crazy about, but the guacamole was really good, and I’m not usually a guacamole fan. The shrimp tasted every bit as good as the description made them sound, but the guacamole had a nice cooling effect that complemented them very well. Everything on the menu looked good, so it took me awhile to decide what to order for my meal. In the end, I went with a Build Your Own combo, which comes with two main items and two sides. 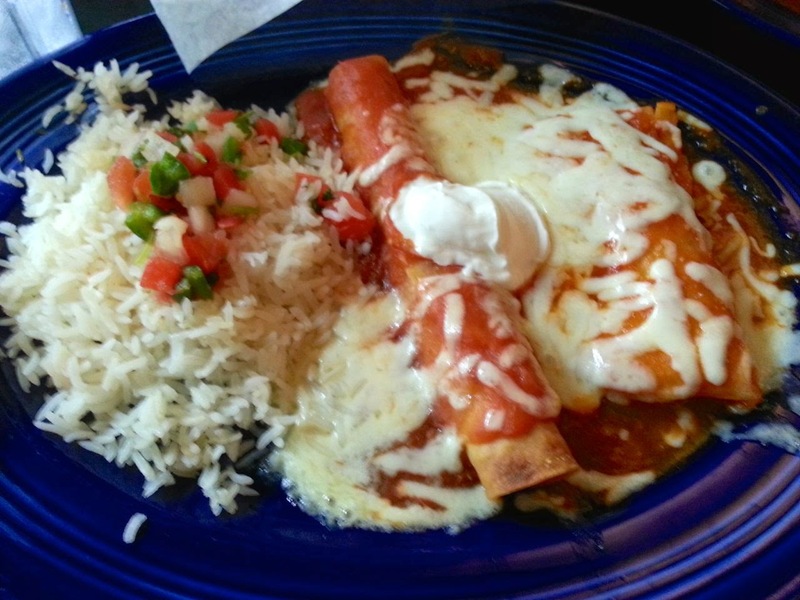 For my main items, I chose a shrimp enchilada topped with chipotle sauce and a chicken flauta, which is a chicken-filled handmade flour tortilla, lightly fried and topped with ranchero sauce, cheese and sour cream. For my sides, I chose a dinner salad with ranch on the side and lime-cilantro rice. So, what did I think of my meal? 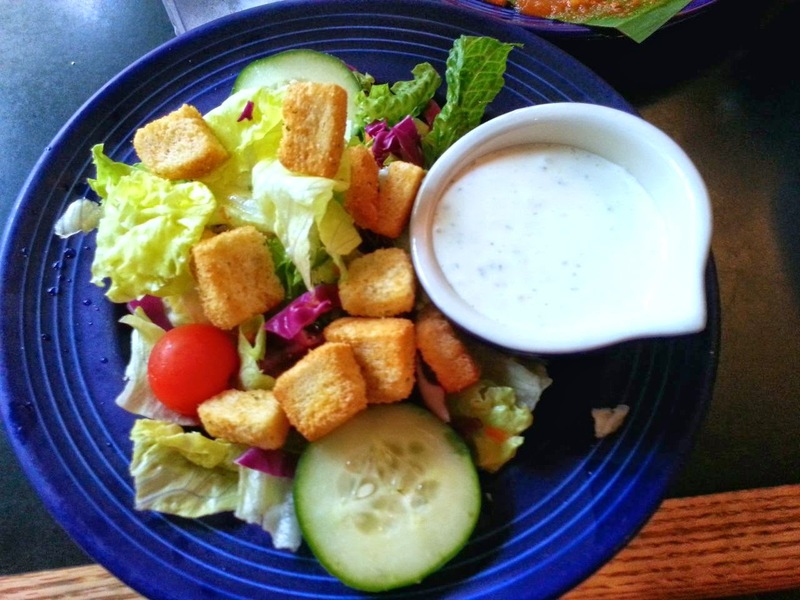 The salad was good. It was what you’d expect. The shrimp in the enchilada was really good, but I didn’t like the corn tortilla it was wrapped in, so I just ate the shrimp out of it. I’m not usually a corn tortilla fan anyway, but I usually don’t mind them with enchiladas. The chicken flauta was good. It was nice and crisp. The cheese that overloaded the top of it was great mixed in with the lime-cilantro rice. My husband ordered the Tres Amigos, which is a combo that comes with a puffy beef taco, a beef enchilada with chile sauce, a hand-made tamale, Spanish rice, refried beans and guacamole. Neither one of us had had a puffy beef taco before. 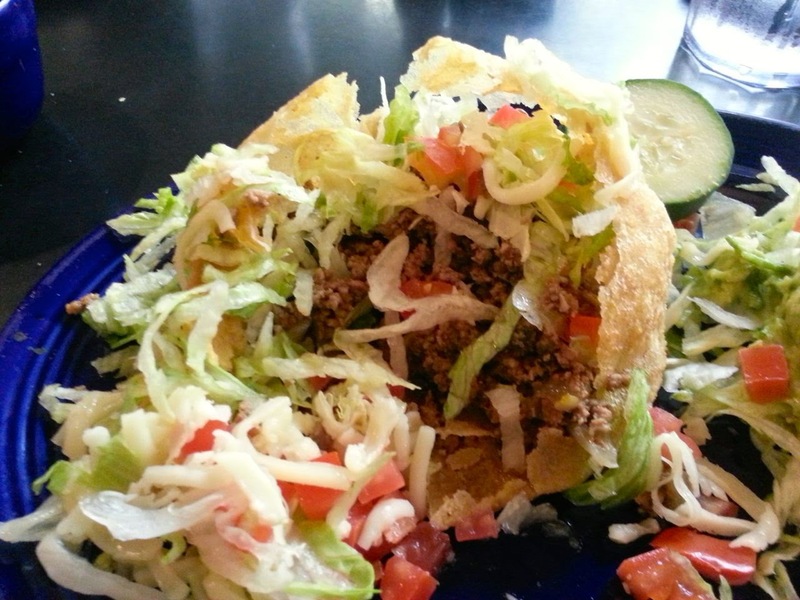 It’s described on the menu as a puffed corn tortilla stuffed with beef and topped with lettuce, tomatoes and cheese. The waiter brought out my husband’s puffy taco at the same time as my salad, which seemed appropriate. 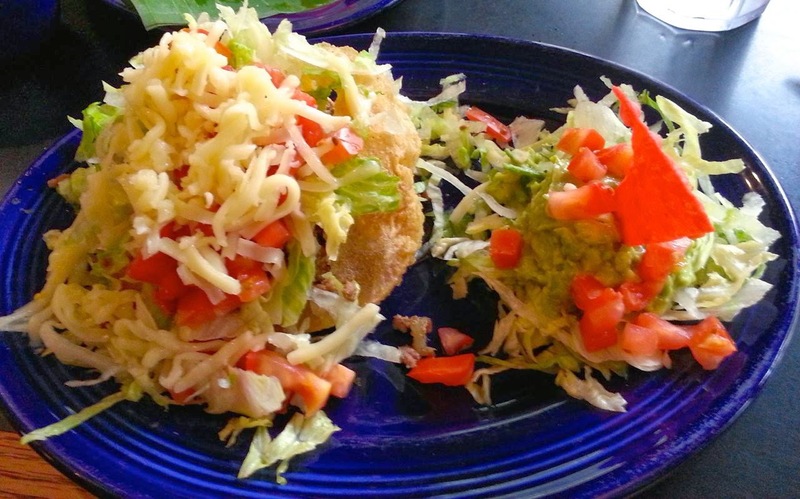 The puffy taco seemed a lot like a small taco salad but a circular one. I tasted it and really liked it. If I came back to Tres Amigos, I might just order puffy tacos, but probably stuffed with chicken instead of beef. As far as the rest of the Tres Amigos combo, my husband thought the tamale tasted frozen. I know the menu says they’re hand-made, but maybe they freeze them after they make them. 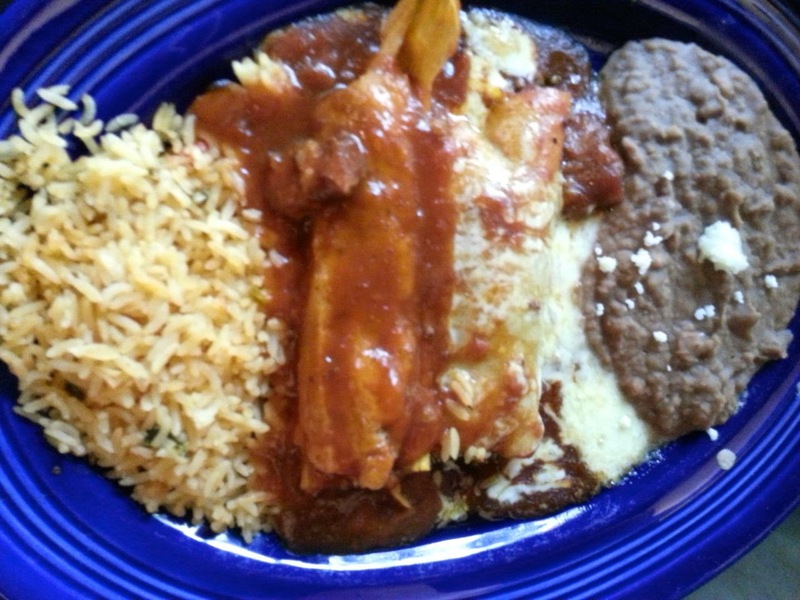 My husband typically prefers cheese enchiladas, but he liked the beef enchilada. He thought the beef was a little under-seasoned, but the cheese and the sauce were flavorful which made up for the lack of seasoning in the beef. My husband always mixes his rice with his beans. He thought they both tasted traditional and very good. We were both beyond stuffed after finishing our meals, but we took a look at the dessert menu anyway. I always like to try things that I’ve never had before, and the Xanga caught my eye. It’s described on the menu as “cheesecake wrapped in sweet bread, lightly fried and topped with vanilla ice-cream, caramel and mango sauce.” I just had to know what it tasted like. We said we were going to share it, so I appreciated that they cut it in half for us. I realized just now typing this and looking at the menu description, that they didn’t top our cheesecake with ice-cream or mango sauce. It was just topped with caramel sauce with a little whipped cream on the side. Um, now I feel ripped off, but until I realized that, I thought the dessert was awesome. The crust the cheesecake was wrapped in wasn’t crisp like a chip. It was a little chewy, but it tasted good. I liked the warm cheesecake. All of the flavors were just delicious together. 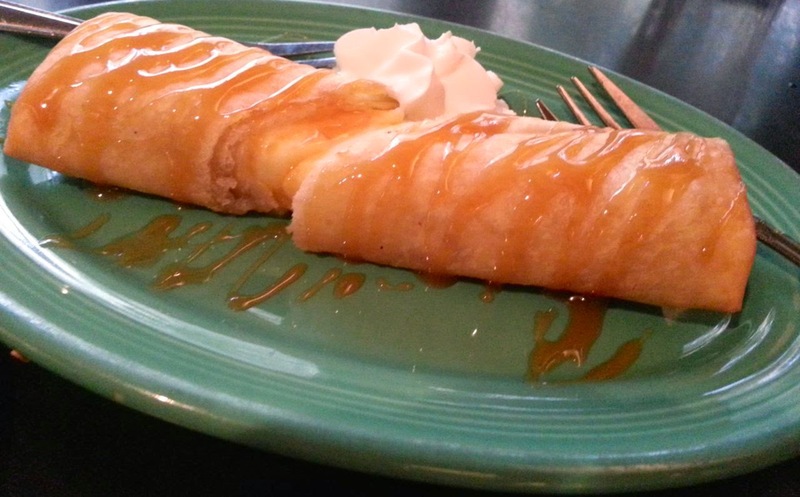 In fact, I could go to Tres Amigos just for the Xanga, but next time I’d make sure they put the ice-cream and mango sauce on my cheesecake as described. That would’ve been even better. 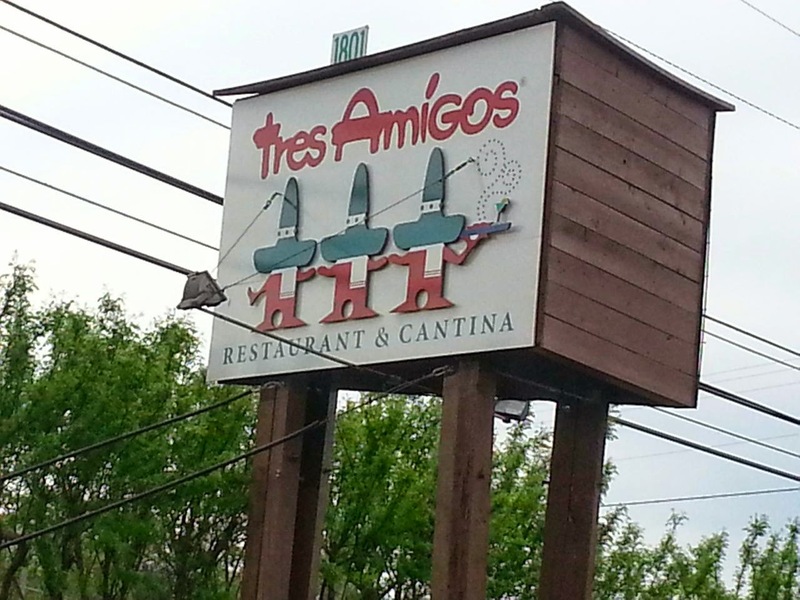 In short, if I lived in Austin, Tres Amigos would be my Chevy’s replacement. 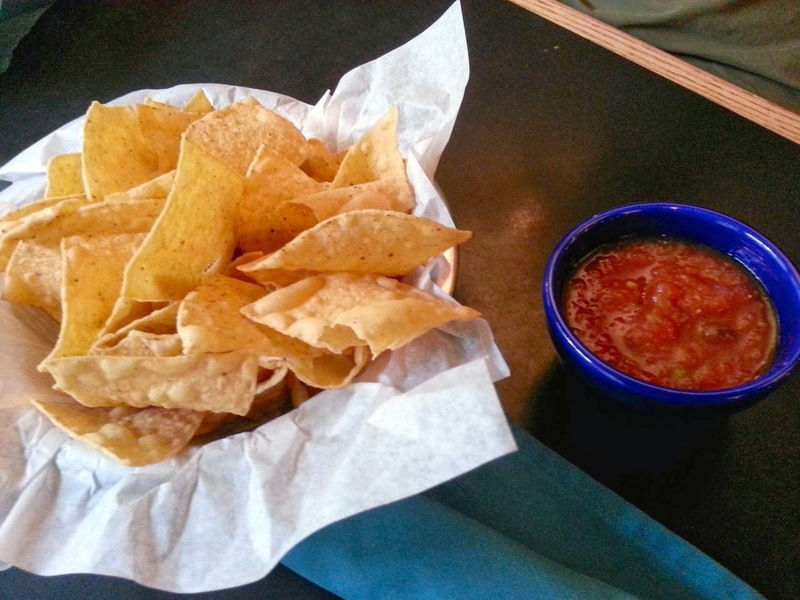 I love the chips and salsa. I love the Shrimp Diablo, the puffy taco and the Xanga. The atmosphere is also really nice. 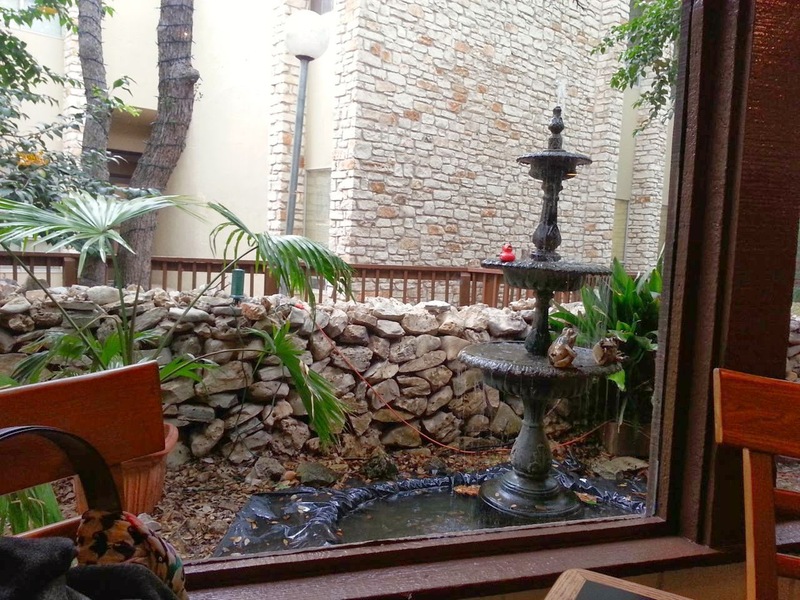 I enjoyed watching the fountain and the animals outside.